A female lawyer whose penchant for inflicting injury on her domestic help has finally landed in police net. 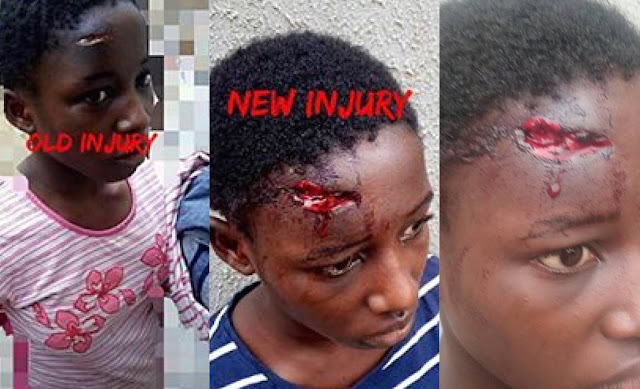 The Lagos State Police Command has arrested one Tolu Olaoye, was arrested by the Lagos State Police Command after she allegedly attacked her her 15-year-old maid Abigail Opebiyi at 5, El Shaddai Crescent, near Unique Estate in Baruwa, Ipaja area of Lagos State. Police Spokesman, Mr. Chike Oti, confirmed the arrest to newsmen on Thursday. He said the arrest followed the order of the State Commissioner of Police, Mr. Edgal Imohimi. Oti said the suspect, who was alleged to be in the habit of abusing her house-help, inflicted serious injury on her, which attracted the attention of the Police boss. The CP, known for his prompt actions on all issues concerning domestic violence and abuse, was moved with compassion on seeing the picture of the victim trending on the Internet with a deep cut on her forehead. “The cut was allegedly inflicted on her by the said female lawyer, Tolu Olaoye. He immediately ordered operatives of the Command to rescue the victim and fish out the suspect. “This order was carried out diligently and the suspect is now undergoing interrogation at the Gender Section of the Police Command in the state.“The suspect will be charged to court on Monday,” he said.